Hot Cocoa Cheesecake has all of the flavors of a cup of hot cocoa tucked into a rich, creamy cheesecake! 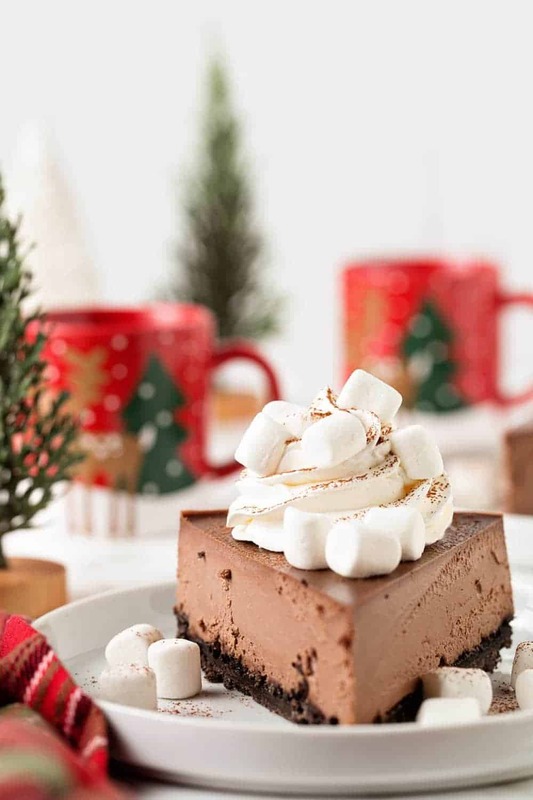 You’ll love this cheesecake, right down to the mini marshmallows on top. I’ve said it before and I’ll say it again, we are a cheesecake lovin’ family. No matter what treats grace our dessert table, the cheesecake always goes first. In fact, on Thanksgiving we had pumpkin pie, pumpkin crunch cake, apple pie, cranberry fluff, pumpkin roll and cherry cheesecake. Guess what went first? Yep, every single piece of cheesecake disappeared within minutes. My family was actually hiding it on plates and in to-go containers around the kitchen. Not to toot my horn, but you guys, I make one heck of a cheesecake and this Hot Cocoa Cheesecake is no exception. Does anyone else sometimes roam the aisles of their local grocery store for fun? I mean, okay, maybe I’m a little skewed because I bake for a living. But I like to see what’s new that I can play with when I’m developing recipes. The other day, on one of my many weekly grocery trips, I spotted a hot cocoa flavored coffee creamer and my mental wheels started spinning. I had to figure out a way to use use it in a recipe immediately. Oh, and in case you’re wondering, it’s pretty amazing in coffee too! A few years back, I made a Sugar Cookie Cheesecake using coffee creamer in place of the heavy cream I would normally use in my cheesecake recipes. You all know how much I love cheesecake, right? So obviously a Hot Cocoa Cheesecake just had to happen using that same coffee creamer trick. I knew I was going to use the hot cocoa coffee creamer to make my Hot Cocoa Cheesecake filling, but obviously I needed to pull in the flavors of hot cocoa throughout the rest of the cheesecake. Not to sound like Buddy the Elf, but you can never have too much hot cocoa. An Oreo cookie crust was a pretty clear choice for the crust. To make an Oreo crust, simply swap crushed Oreo cookies for graham crackers in a typical cheesecake crust. Make sure to use the whole cookies, cream filling and all! Making the Hot Cocoa Cheesecake filling is the same process that we typically follow for cheesecakes. Start by beating the cream cheese well, then add the sugar. 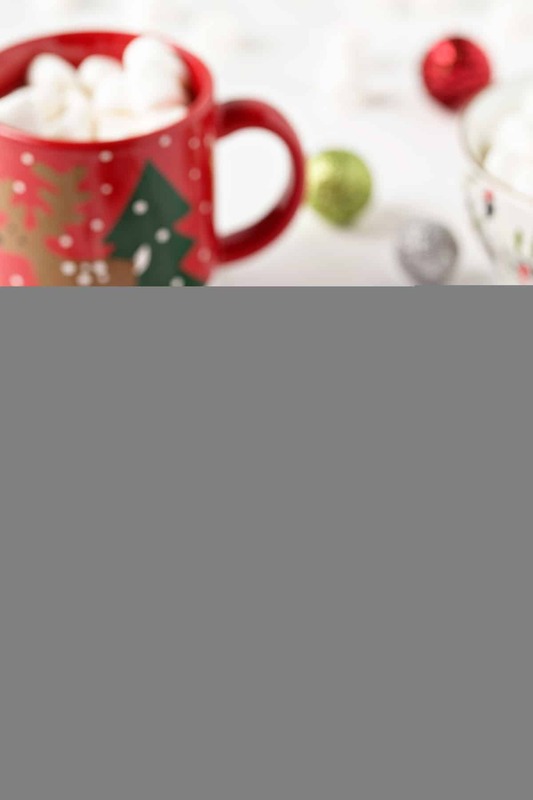 Eggs get added one at a time before adding the hot cocoa coffee creamer mixed with melted chocolate. 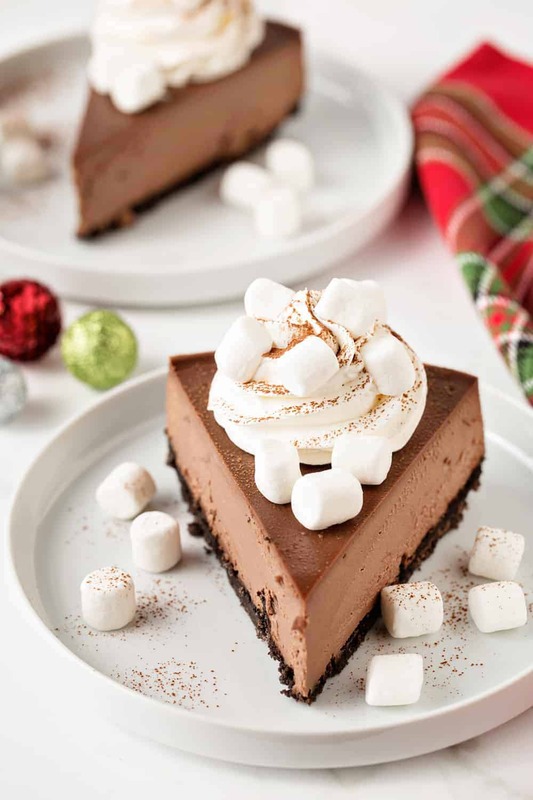 Once the cheesecake is baked and chilled and we’re ready to serve it, I topped it with whipped cream and finished it with Campfire® Mini White Marshmallows and a sprinkling of cocoa powder. 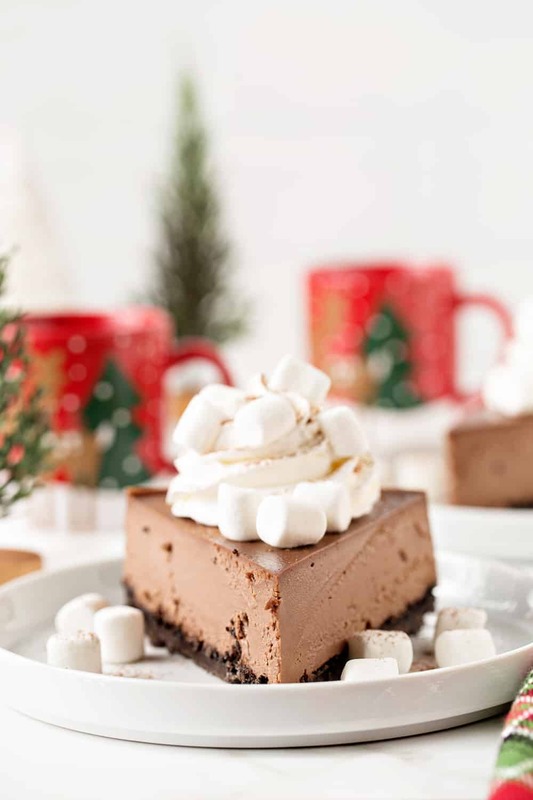 Because no cup of hot cocoa would be complete without marshmallows, and this Hot Cocoa Cheesecake isn’t either! 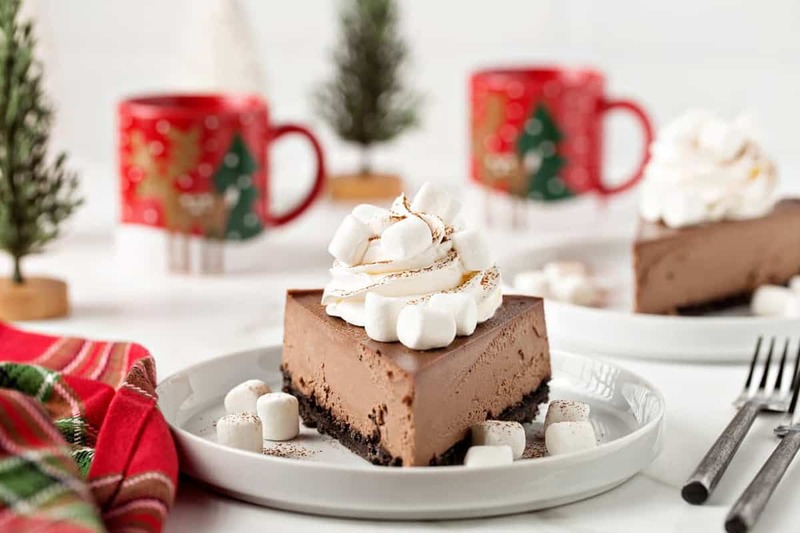 I’ve turned to Campfire® Marshmallows endless times over the past few years whenever I needed the perfect marshmallows for my recipes, just like with this Hot Cocoa Cheesecake because, in my opinion, they are simply the best marshmallows on the market. We’ve created tons of delicious dishes and desserts throughout 2018 and have even more coming your way as we look to the new year. 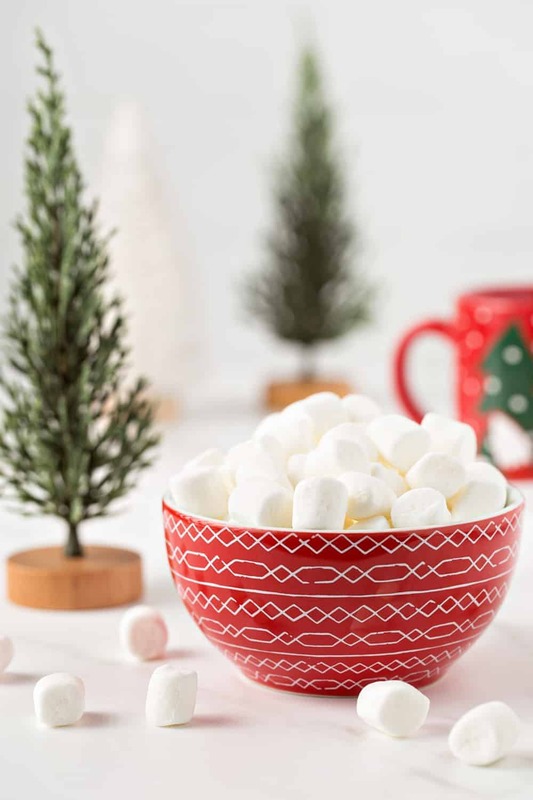 We even created a Marshmallow Madness Pinterest board where we’ve pinned loads of delicious ooey-gooey marshmallow recipes, just like Hot Cocoa Cheesecake and some of my other seasonal favorites including Gingerbread Marshmallow Treat Cupcakes and White Chocolate Peppermint Cocoa. 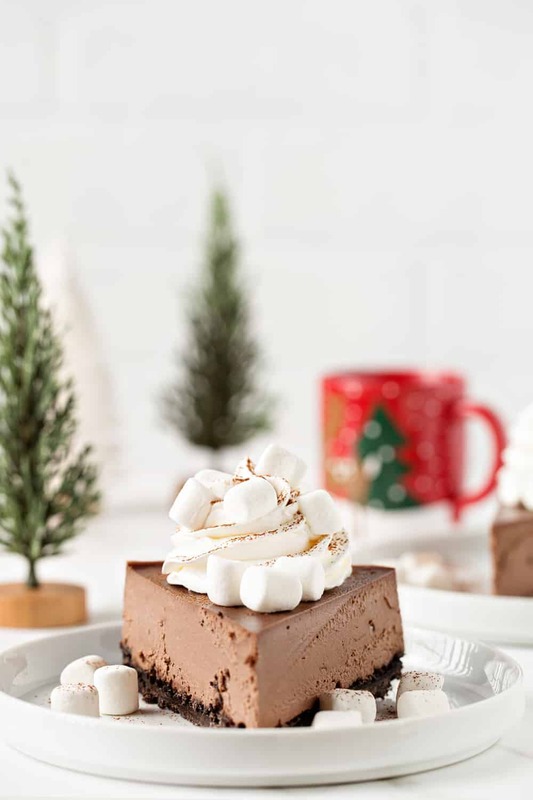 Make Hot Cocoa Cheesecake this season and add it to your holiday table. You’ll love everything from the rich, creamy filling to the fluffy marshmallows on top. Preheat oven to 350°F. Tightly wrap a 9-inch springform pan in heavy duty foil. This step prevents leaks when using a water bath. I also take the extra step by placing the foil wrapped springform pan inside an oven bag while baking, but this is optional. Lightly spray the inside of the pan with nonstick cooking spray. Mix together the Oreo cookie crumbs and butter and press them into the bottom of your pan. Bake for 8 minutes and place on a wire rack to cool. Combine the chocolate chips and coffee creamer in a large microwave-safe bowl. Microwave at 50% power in 30-second increments until the chocolate is melted and the mixture is smooth. Be sure to stir the mixture every 30 seconds. Set aside to cool while you prepare the filling. In the bowl of your stand mixer fitted with your paddle attachment, beat the cream cheese until smooth. Add sugar and mix until combined. Add eggs, one at a time, fully incorporating each before adding the next. Make sure to scrape down the bowl in between each egg. Add vanilla and mix until combined. Add in the chocolate mixture and beat until it is fully incorporated into the cheesecake filling. Add in the flour and mix until combined. Scrape down the sides of your bowl and beat again until the mixture is completely smooth. Bake for 60 minutes. The edges will appear to be set, but the center will still have a slight jiggle to it. At this point, turn off the oven, but leave the door cracked and allow the cheesecake to rest in the cooling oven for one hour. 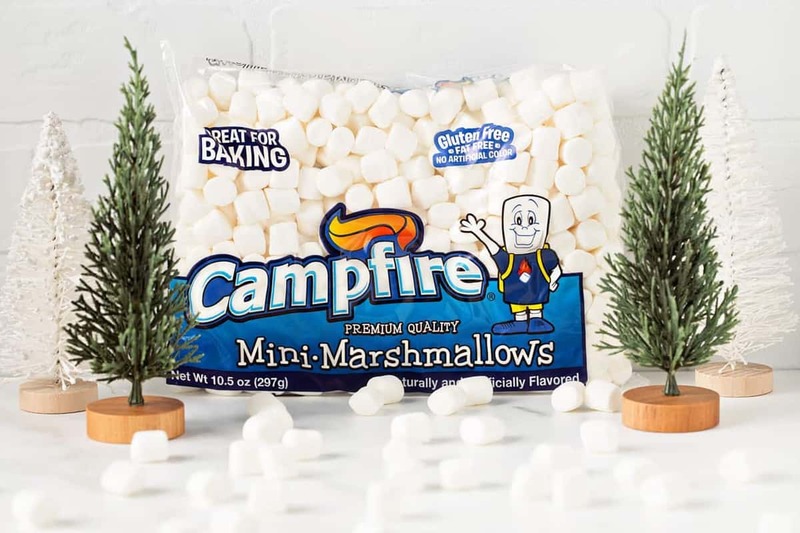 Before serving, top with whipped cream and Campfire® Mini White Marshmallows.